Students will learn the history and significance of Fiesta by reading short passages, answering comprehension questions, and simple art activities. 1. 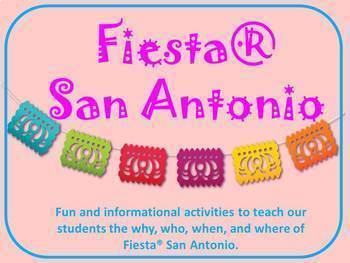 Fiesta is Born- Students will read and answer multiple choice questions about how Fiesta®San Antonio originated. They will also write a Fiesta acrostic poem. 2. Fiesta Medals- Students will read about the origin of Fiesta medals, answer three math questions, and design their own Fiesta medal on a template. 3. 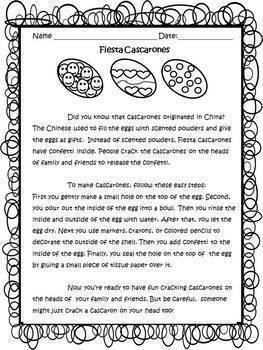 Fiesta Cascarones- Students will read the steps to making cascarones, complete a sequencing activity, and color their own cascaron. 4. 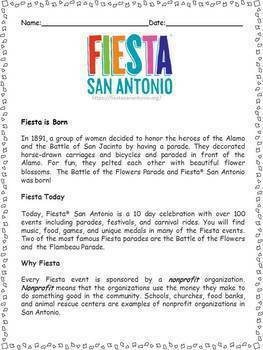 Fiesta Pooch Parade- Students will read about this special parade as well as the nonprofit organization that sponsors it. They will answer written questions and design a costume for a dog using a paper template. 5. 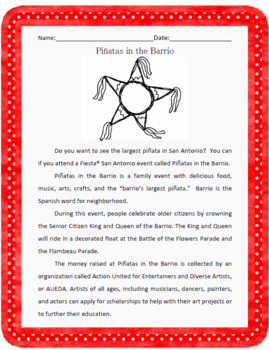 Piñatas in the Barrio- Students will read about this event as well as the nonprofit organization that sponsors it. They will answer multiple choice questions, color and design their own piñata using a paper template.